With the unpredictable nature and high stakes racing that innately exists at NASCAR’s biggest track, Talladega (Alabama) Superspeedway, there is always a lot that goes in to hoisting a trophy there. For Kyle Busch, racing to his second Talladega win in Sunday’s GEICO 500 (2 p.m., FOX, MRN, SiriusXM Radio) will not just be a sense of season accomplishment – it would mark his fourth consecutive 2018 Monster Energy NASCAR Cup Series race win in the No. 18 Joe Gibbs Toyota and absolutely worthy for the sport’s all-time record books. Only one other driver in the field this weekend – seven-time Cup champion Jimmie Johnson – has accomplished the four-peat. He won four straight races in 2007. It’s happened only 12 times in the sport’s history. And five times the driver to win four straight races did go on to capture the Cup title that season. Johnson being the most recent. None of the other eight Modern Era drivers that have won four consecutive races, have had Talladega in that span of victory, however. Busch acknowledged the unpredictability of competing in the tight packs that characterize restrictor-plate racing on the series’ largest track (2.66-miles). The “Big One” is a common occurrence when one driver’s “slip-up” involves crashing out multiple cars. Being in the right place at the right time is half-strategy and half-luck. “At Talladega, the physical demand isn’t that big of deal,’’ Busch said. “You can run around there all day long and not break a sweat, really. Once you get down into the nitty-gritty of the race and try to play the chess game at the end of the race, you’ve got to really pick and choose your spots and think all the time if you go here and team up with this guy. Busch won the spring race at Talladega in 2007 and has finishes of second and third in the last two years, respectively. 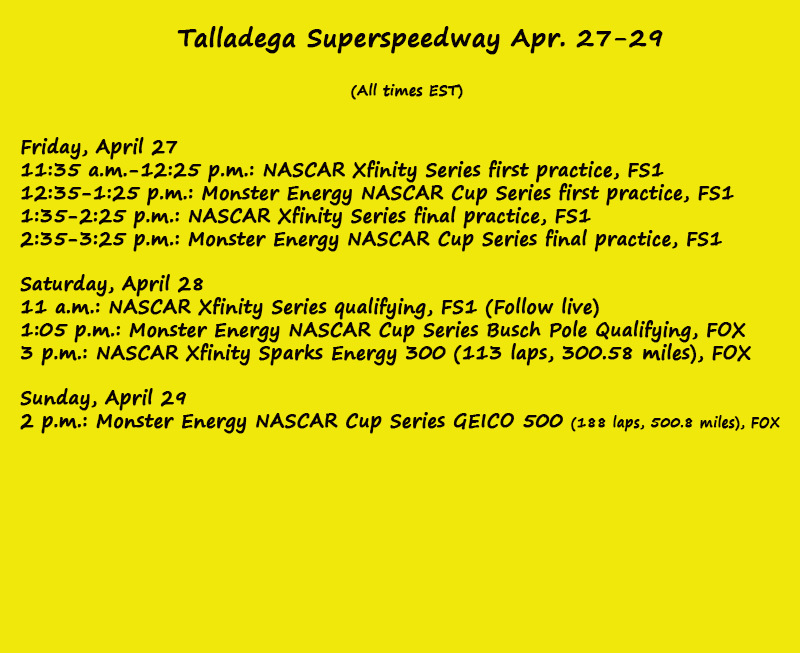 Not only does competition at Talladega Superspeedway pique fans interest for the full speed, high-stakes brand of restrictor-plate racing, this week marks the highly-anticipated all-driver broadcast for the Sparks Energy 300 (3 p.m. ET on FOX, MRN and SiriusXM NASCAR Radio). Monster Energy Cup drivers Kevin Harvick, Clint Bowyer, Joey Logano, Ryan Blaney, Erik Jones, Ricky Stenhouse, Jr., Brad Keselowski and Darrell Wallace Jr. will participate – going from the driver’s seat to the broadcast booth and pit road. Harvick will be calling the play-by-play alongside his Stewart-Haas Racing teammate Clint Bowyer and Penske Racing’s Joey Logano in the booth. Five-time Talladega Cup winner Keselowski and defending Monster Energy race winner Stenhouse will anchor the Hollywood Hotel and “Bubba” Wallace, Jones, and Blaney will serve as pit road reporters. 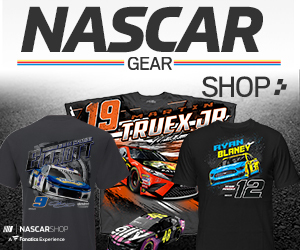 Interestingly – Blaney’s win at Pocono (Pa.) Raceway last summer happened following a similar all-driver broadcast. Veteran championship contender Elliott Sadler will try to win a second consecutive check for $100,000 from series sponsor Xfinity. Sadler, last week’s winner, along with Christopher Bell, Matt Tifft and Austin Cindric will compete for the bonus check Saturday. It’s the first time the NASCAR XFINITY Series Dash 4 Cash program incentive program has included the historic Talladega high banks on its four-race schedule. Only Xfinity Series regulars will be in the race. This is the first opportunity for the incentive check for 22-year-old Tifft and 19-year-old Cindric. The top four finishers in Saturday’s race will then be eligible to compete for the $100,000 check at Dover International Speedway next week. What to Watch For: Only four active drivers have won three straight Cup races – Kyle Bush, Jimmie Johnson, Kevin Harvick and Joey Logano. Johnson (in 2007) is the only one to have extended the streak to four. Busch can make it four straight should he win on Sunday. …Talladega is absolutely a wild card race for reigning Monster Energy NASCAR Cup champion Martin Truex Jr. He has 12 DNFs in 26 starts – twice as many DNFs as any other driver currently ranked in the Top 16. …Jamie McMurray leads active drivers with eight top-five finishes at Talladega. He won the spring race in 2013. …Defending winner Ricky Stenhouse Jr. and Brad Keselowski both scored their first Cup victories at Talladega. …Front Row Motorsports driver David Ragan won this race in 2013, his second restrictor-plate victory. …The late seven-time champion Dale Earnhardt is the winningest competitor at Talladega with 10 Cup wins. …Denny Hamlin won this race in 2014 from the 34th starting position – the farthest back on the grid a winner has started. … The outside pole position has been the most successful starting position – producing 20 winners. What to Watch For: Veteran Elliott Sadler sits atop nearly all the statistical categories when it comes to racing at Talladega. Sadler has the most wins (two), poles (two), starts (27), runner-up finishes (four), top-five finishes (11) and laps led (267) among his competition on Saturday. …Justin Allgaier holds the top spot for average running position at ‘Dega (8.2). …There have been eight different winners in the eight 2018 season-opening races. Should a new winner hoist the trophy Saturday, it would mark the third longest streak of different winners to start a season. This is the third time (also 1998 and 2006) that eight different drivers have won in the first eight races. … Christopher Bell, last week’s winner at Richmond, has five top fives in the last seven races and sits in second place in the points standings, 29 markers behind Sadler. This will be his and third place Tyler Reddick’s Xfinity Series debut on the Talladega high banks. …Former Xfinity Series champion Joe Nemechek – father of current Xfinity Series driver John Hunter Nemechek – is attempting to make his 1,142nd start in one of NASCAR’s three major series. Should he make the field for Saturday’s Xfinity race, he would be only one start short of NASCAR Hall of Famer Mark Martin’s (1,143) total – second on the all-time list.